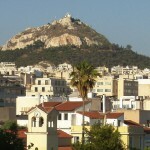 Lykavittos Hill (sometimes referred to as Lycabettos or Lykabettos) is the highest point in Athens. 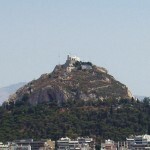 Because of its height, it is visible from almost every part of the capital. Its name reflects a popular belief that the hill was inhabited by wolves. A small chapel of St. George (Agios Georgios) was erected in the 19th century on its top. The theatre on the hill is used for concerts and spectacles. To reach the top a the funicular from Kolonaki may be taken.